This might be a review, might be a synopsis, might be a play-by-play. 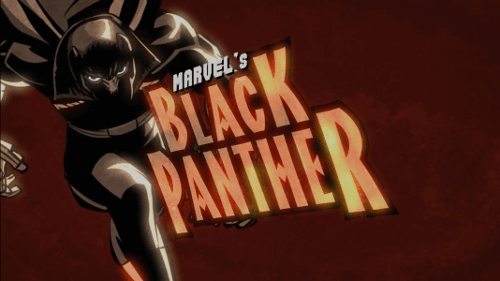 I’m typing it while I watch The “Black Panther” Marvel Knights animated comic (motion comic) for a second time. I like motion comics in small doses, and The Black Panther is the best one Marvel has done thus far. Motion comic (or animated comic) is the term used for animation that emulates comic books by mixing elements of print and animation. One of the things I love most about the Black Panther series is the constant juxtaposition of modern with ancient (technology, architecture, etc) paired with the dichotomy of ancient customs with pop culture. This mini-series was presented with BET Networks. There is an anti-American government sentiment to this miniseries. Some background on the Black Panther for those of you not familiar with him. The Black Panther is the political (social and military) and spiritual ruler and protector of Wakanda, a fantastic African nation Marvle “invented”. The show opens on a plain in Africa on the border of Wakanda in the fifth century AD. A neighboring tribe has come to war with the Wakandans. This intro is designed to setup the fact that the Wakandans are an unparalleled military force and have been around for a long time. The warring party is decimated save one member, who is left alive to flee and warn others. Cut to modern times (second term of George W. Bush’s presidency). Military and political types (one voiced by Stan Lee) are discussing that Wakanda has declared itself a no fly zone. One person, the Wakanda expert, starts to get into detail about the nation: they have a ton of oil, but don’t use it or want it (only clean alternative energy forms are used and they have a self-contained economy) and they have never been defeated, by anybody, ever. Flash-back to World War II; Captain America jumps from a plane. He is to enter Wakanda, stop a Nazi task force, and gather intel. He is not needed, the Wakandans have an intelligence network unparalleled by anyone on the planet, and the Black Panther has neutralized the threat (the Nazi’s head are mounted on wooden stakes). Cap won’t back down, so the Black Panther teaches him a lesson. More details are revealed about the man behind the Black Panther’s mask. The Black Panther is the spiritual, political, and military leader to the people of Wakanda, who not only makes decisions for the nation, but personally protects and serves it. It is a heredity title, but is open to be taken through a legitimate process (hand-to-hand combat). T’Challa, the son of T’Chaka, defeats his uncle S’yan (the current Black Panther) to ascend the throne; T’Challa’s cousin T’shan tried but failed. Back to Washington, some think that Wakanda is a threat (even though they have never invaded another nation, and have only battled in self-defense). We are now let-in on the dirty secret of the evil US Black Ops, reanimating dead soldiers; essentially zombie special forces with built-in weaponry. We start in Monoco, and are introduced to the main villain of the story, Klaw. Klaw is assembling a bad-guy squad to kill the Black Panther and take-over Wakanda. We get a glimpse into the close brother-sister relationship that T’Challa has with Princess Shuri. Klaw is now trying to recruit another bad guy. He tells about one of his ancestors, a racist old man who planned to attack Wakanda. A robotic device is used by the Black Panther to deter the attack by causing the gun powder to explode before firing; this is during the European settlement of Africa. Klaw reveals that he killed a Black Panther fifteen years ago. T’Challa is inaugurated as the new Black Panther. T’Challa gathers his advisors, and wants to know why the man who killed is father (presumably Klaw) has not been found. Change scene to a New York brothel. Klaw has brought his newest recruit to receive some “entertainment”. Back to T’Challa and his advisors. They ponder asking for cooperation from other intelligence agencies, such as the CIA, in exchange for the cure to cancer. The idea is rejected. T’Challa appoints his T’shan as ambassador to the United Nations (the same cousin who failed to become the Black Panther, and is still sore about it). And, back to the brothel. This guy is paying a huge amount to kiss the prostitute on the mouth. Alright, now he (as the female prostitute) has taken over her body and joins Klaw in the car. Ororo (AKA Storm from X-Men) calls for T’Challa, and is not connected. We are taken to a fight scene between the Juggernaut and the X-Men (Cyclops, Wolverine, and Nightcrawler). Klaw has come to hire Juggernaut and they walk off together. Change scenes, the Black Panther is running through the forest, and is torn to shreds by bullets from a Deathlok (the zombie soldiers). It is not really the Black Panther though, just a sick training exercise. Juggernaut entertains himself by head-butting a charging rhino (and wins).Through banter with Batroc (the French assassin hired by Klaw) Juggernaut’s lack of intelligence and wit is made-fun-of. We meet the final member of Klaw’s team, Igor, a nuclear scientist. Now we get to see how Klaw killed T’Challa’s father. It was at a secret economic conference. One thing about the Wakandan’s, they value honor above all else. So, the king refuses to sell oil or vibranium to the interested parties, knowing they will not use it for good. A sniper is set to take-out the king, but is stopped by the window pane (vibranium covered). Klaw makes a grand entrance by busting through the floor, injuring the young T’Challa. His father springs into action, attacking Klaw, and is killed. Beginning with a flashback where T’Challa has wounded Klaw after the assassination of his father. Klaw reveals to Batroc that he was experimented on after his near-death attack on the Black Panther and his family, and that powerful people are bank rolling his revenge. Now at the Queen’s Palace; T’Challa and his mother, the Queen Mother, are discussing his duties and responsibilities (and reveal that he was once involved with Storm). She tells Princess Shuri of how he and Storm met, while he was on walkabout (which is Australian, not African, way to go Marvel writers, top points for cultural sensitivity). She stole from him while he was in the ghettos of Cairo. They fell in love, but he left her because he was consumed with revenge and wanted to find the man who killed his father. On to The Vatican; Cannibal (as the attractive woman) is here to meet with a cardinal. Klaw wants something The Church has. It is the Black Knight (who rides a Pegasus), an undefeated “Holy Warrior”. Back in Wakanda T’Challa is meeting with his advisors to discuss the state of finding his father’s assassin. The point is made that now that T’Challa is King and “in the open” the killer will probably seek him out to “finish the job”. At the Great Mound (the only Vibranium mine on Earth) a group of kids are touring the facilities. A worker destabilizes the wall, and the building and mine begins to collapse! The Black Panther is on the scene, leaps, and saves a falling child. Upon zooming out we see that the problem was caused by Igor, Klaw’s nuclear guy. Shuri wants to lead a team of experts into the mine to investigate the true cause of the earthquake. T’Challa takes a moment to explain his humanity to a young boy (the child he saved from falling). At The White House they are debating how to invade Wakanda, since Wakandan’s don’t attack unless provoked it would be politically incorrect to do such a thing. So they decide to have one of Wakanda’s neighbors, Niganda, start a border dispute. M’Butu, leader of Niganda, is beating someone. He stops to meet with Klaw, who has paid him for use of his army. He requests a plumber (to help Igor). Cannibal is sent to New York, where he must gain entry to the United Nations. The Black Knight will lead the hired army. Klaw interrupts The Black Night’s prayer to get him to encourage the troops. T’Challa is having a dream. He is in the jungle, confronted by a giant white panther, where he is chewed-up and spit out. Then put back together by some ladies. He is woken by guards with an “Emergency”. T’Challa recognizes Juggernaut. Fighter Jets are dispatched to stop him, but they are waylaid by the Black Night. A missile is launched at The Great Mound, an evacuation order is issued. Princess Shuri is in the mound, they have discovered that there is a problem with some of the vibranium, caused by isotope meddling. The Black Night continues attacking the fighter jets. Juggernaut begins to break though populated areas. The Nigandan troops have been spotted. Shuri realizes that the missile that hit The Great Mound was not a missle, is was a transport. Igor comes out and begins killing people, and calls himself “Radioactive man”. T’Challa calls M’Butu, where M’Butu reveals that he knows Klaw and that he (Klaw) was the one who killed T’Challa’s father. After the recap we see that the Wakandans have discovered who Klaw is and that he is behind the attacks. The White House has decided that they will “assist” Wakanda with Klaw and the Nigandan forces. Storm is using Cerebro to locate Juggernaut. She denies Cyclops, Wolverine, and Nightcrawler from joining her, Cyclops and Wolverine bicker on the side. Juggernaut is tearing through the Wakandan village side, while the Black Night destroys fighter jet after fighter jet. A U.S. naval carrier is positioned off the African coast. Shuri calls her uncle from the Great Mound, where she is hiding from Radioactive Man. The Black Panther heads out to confront the Black Night. The Wakandan’s finally bring Juggernaut down with tranquilizer missiles (missiles filled with tranquilizer gas). The Black Panther and the Black Knight fight in the sky. The Panther poses a question “You said your success was because God was on your side, now that you’re losing, has God forsaken you?” The Black Knight is bested and drops his sword into the Great Mound. Cannibal is in New York City (still as the woman). T’shan is there, as the Wakanda ambassador to the UN. Cannibal approaches him, seductively, offering help with the invasion. The Wakandans are constructing a vibranium cell to hold Juggernaut. Even after being informed of his sister’s predicament T’Challa continues to fly into Niganda, to “take the fight to them”. Shuri is hiding from Radioactive Man, who knows she is somewhere nearby. Cannibal is telling T’shan that her husband, Igor, is Radioactive Man, and that she will help stop him if the Wakandans help cure him (Igor) afterwards. The Black Panther is attacking the Royal Palace in Niganda, looking for M’Butu. Ross (US Wakanda specialist) is on the US carrier, which is full of caskets covered in American flags, US soldiers. The caskets open and reanimated cyborg soldier, come out and jump off the ship (to walk to shore, Pirates of the Caribbean style). The Queen Mother wants out of her room to save Shuri herslf. But Klaw and Batroc kill the guard and bust into her room. Before <uncle> can react they see the zombie soldiers coming onshore. T’Challa has reached M’butu, Klaw is on the TV screen threatening the Queen Mother. Klaw has Radioactive Man cause a small earthquake to show T’Challa what he is capable of. The Zombie soldiers continue to advance. Klaw wants to be named the new ruler of Wakanda, and demands T’Challa kill himself of else he will turn the country into a “pothole”. With the Black Night and Juggernaut in custody Klaw is still trying to threaten T’Challa with him mother’s death to get him to commit suicide. S’yan bursts into the queen’s chamber in his old Black Panther suit. On the royal plane T’shan and his assistant are bringing Cannibal to Wakanda. The Queen escapes. S’yan is taken down by Klaw during a monologue, Batroc is taken out by a royal guard. Storm requests clearance to land in Wakanda, and is denied. So she jumps out of the jet (set on auto-pilot) and flies in on her own. Princess Shuri is fighting the Radioactive Man by throwing rocks at him. Wakandan intelligence has determined the American soldiers are reanimated cyborg corpses (40% – 70% organic material). The American troops (who are there under the guise of helping Wakanda) are in a firefight with Wakandan troops. Storm arrives. Klaw enters the Wakanda mainframe (transfers his essence into the computer using one of his cybernetic attachments). He is trying to disable the security cameras first; Igor distracts him though as he is trying to get Shuri. Shuri happens upon the Black Night’s sword (which helps clarify part of the shows intro). Klaw spots the American zombie troops in the security footage, and alerts his team that the “timetable has been accelerated”. Igor is ordered to collapse the country if he (Klaw) is not done in fifteen minutes. T’Challa is alerted to Klaw’s cyber activities, and that they are losing their power grid, security feeds, and other defenses. T’Challa commands that manual control of the security protocols be routed to his CAT (flying motorcycle thing). Storm brings down rain, wind, and lightening on the cyborg troops. The majority of the U.S. troops are destroyed, but there are a few in a different area that are still active. T’Challa, while flying, is rewriting the security code to attack Klaw. Klaw disconnects from the mainframe right as T’Challa busts through the window. While shooting at T’Challa one of Klaw’s stray shots hits T’shan’s plane and it begins to free fall. Igor has cornered Shuri, but she has the Black Night’s sword. She slices him in two. T’Shan’s advisor is dead. Cannibal, still alive but dying, enters T’Shan’s body. The Queen Mother and S’yan escape. Klaw and T’Challa are fighting. T’Challa wins, avenging his father. Batroc surrenders. The American zombie troops arrive, and are dismissed under threat of war. Storm enters the room. S’yan is alive and has a prosthetic leg. He rushes to his son’s (who is actually Cannibal) side. Shuri is brought out from the Great Mound and reunited with her brother. At the White House Candelleza Rice finishes briefing two people with similarities to Barrack Obama and Hilary Clinton. The story closes on Shuri practicing with her new sword and T’Challa riding off to serve his nation. Is the series canceled. I am just starting to watch it. All I see are 12 episodes. on youtube. I love what I saw. I am about to but it. It is a great series, my favorite Marvel Knights production so far. It did not get canceled, it was only deigned to run as a miniseries. The Thor one is decent, better than Iron Man Extemis and Spider-Woman IMO. You should also check out the Astonishing X-men if you like this type of animation. They are all single series shorts.